It’s interesting how wines cycle in and out of fashion. Wine like rosé, riesling and chardonnay are all being pushed back into the light. Pinot gris on the other hand is being ridiculed quietly, possibly because it became too popular too quickly. Possibly because the style can be confusing. Personally I have no issue with it. Gewürztraminer, I feel confident, will never be popular. It is hard to pronounce, and is a wine that can deliver an aromatic wollop of peerless precision. Although accurate, it is a style most are unaccustomed. It fits awkwardly into no particular box at all. It is so unusual compared to most whites, no box for it exists. And that is its success. It is unique. It is also its failing, as there is a tiny sliver of the market for these wines to exist. However small the market share of this decidedly unusual wine, for me, Delatite is the definitive Gewürztraminer in Australia. The pyramid it sits atop may be small, but it takes pride of place there nonetheless. The current release of the Dead Man’s Hill has that tell tale nose of petals and asian fruit – lychee and longan. The weight of the wine is full but not gaggy. It is a complete, perfumed and wonderful glass of wine. To me, this wine defines delightful. It is refreshing, curious and rare. 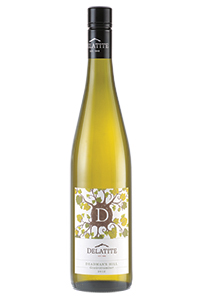 Alongside the Gewürztraminer is a full bodied and textured pinot gris. Aromatically challenged in comparison to the Gewürztraminer, it is a wonder these grapes sit under the same heading at all. It has classic notes of pears and a leesy core with fresh acidity. It is the modern style of Australian gris eschewing the plump perfumed and slightly sweet template that once dominated. The third in this aromatic triumvirate is the Riesling. It is stony, yet hides a rich ripe yellow fruited core. Actually it doesn’t hide it at all, it is on full display. It has honey, nougat, bergamot ( like the tea) and apricot and yellow peach. I’ve embarrassingly forgotten how good this wine is. So many Australian rieslings focus on the ‘thrilling lemon lime’ thing, this is most certainly in the ‘ripe fruit euro styled’ camp. I was going to have a picture of each bottle, but they all look the same. If you want to know what the riesling looks like, picture this one, with the word riesling on it. Oh, and yes, Delatite have rebranded.